Works okay. Not as tight as I wanted but it'll work. Had a little bit of a problem adjusting it for my pistol. Good service, good holster, just gotta wear it for awhile to break it in. Will this holster work for my 2" colt agent .38 snub nose? Yes, select "Small Frame 5-Shot Revolver.."
Select "Small Frame 5-Shot Revolver with Hammer Spur (2" bbl)" as your fit. 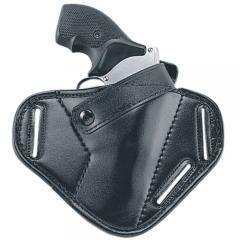 Yes, this holster will accommodate small single action - double action revolvers with or without a hammer. Can you use a S&W Model 60 J-Frame with hammer in this holster? I'm referring to the thumb break fasting around the hammer,thanks. Yes, just select the "Small Frame 5-Shot Revolver with Hammer Spur (2" bbl)" as your fit.